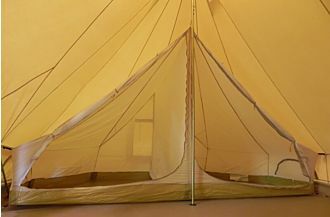 The Sibley 600 Twin Standard is a mash up of two bell tents connected with a ridge pole. The unique oval floor plan creates two “wings” on either side of a central living room area. The steep angle of the canvas and cathedral like ceilings of the Twin provide ample ‘pacing space’ and a roomy interior. Inside and out, the Twin looks and feels as large as the (round) Sibley 600. However, the Twin is smaller by the numbers: Measuring 6 meters x 4 meters (19ft 8in x 13ft 1in) with 20,5m² (220 ft²) of floor space The Sibley 600 Twin is based on the medieval wedge tent, and can also be referred to as an Emperor Tent or a Double Bell Tent. Recommended for floorless use, all tents in the Standard series are made of Classic Canvas (320 gr/m² or 9.5 oz/yd²) with sewn in sod slaps. 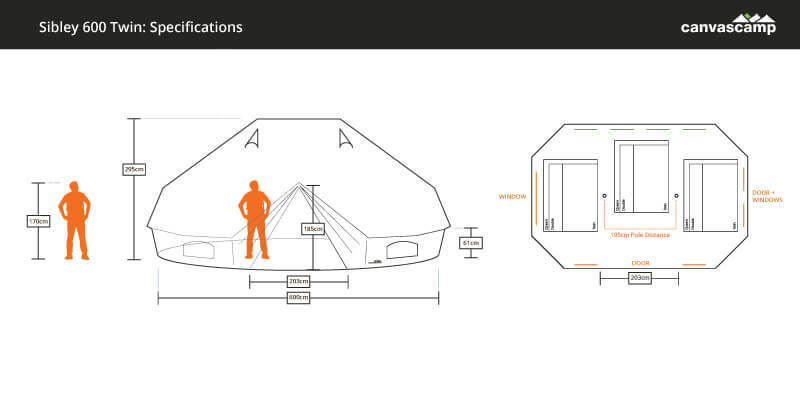 To take advantage of the Twin’s additional side door and create a multiple room tent: use a Sibley Connector to join the Twin with a second Sibley of any size. The 600 Twin is equipped with a front door and a side door. The side door includes two square mesh windows equipped with roll up canvas covers. The Sibley’s signature A-frame door allows for easy entry and exit, and holds the canvas at 90 degrees from the ground preventing rain from falling into the tent when moving in and out. Spring loaded poles snap together quickly for easy set up and fold together for fast take down and organized storage. The top of each A-frame door is equipped with a pin that sits in a grommet at the peak of the door to ensure proper placement. A rain cap is then placed over the pin and grommet to keep rain from running down the poles. Each side of the door is equipped with loops and ropes to neatly tie back the canvas and hold them open when not in use. Our Standard series comes with 3mm guy ropes that will need to be tied on before your first pitch. Check out our assembly instructions in the Specifications tab to get a feel for the initial set up process. Our Pro Series comes with pre-attached guy lines and tensioners for those customers looking for an out-of-the-box set up. Plastic tensioners prevent edges from cutting into the guy lines and prolong the life of your tent. Due to the unique shape and dual center poles on the Twin, there are lot of guy lines (25 in total) and you will need to spend a little extra time making sure they are all tensioned correctly for a perfect pitch. 9 no-seeum mesh windows with zip up canvas cover, 6 half moon on side wall, 1 large “picture” window on the end left of the main entrance, 2 square windows on each half of the door to the right of the main entrance.